Of the many joys in collecting, I love making space in my dupe box. Anytime I can find a want list with cards I can fill, it brings me happiness on two levels. The first is that I will make space for organizing, cuz invariably I'm going to have duplicates. Second is that my dupes will magically transform into stuff I want. Sooooo tell me what you want - what you really really want. Did you not get my order of protection, Posh? Anyway, two trade packages in a couple days showed up, and boy oh boy did they have wonder. First in the mailbox was Jeff. We have traded before, and for some reason he still isn't blogging. Jeff - just do it, alright? Jeff is a Cubs collector and filled my request by dropping his Cubs wants list to my email, along with the offer of a card I would be glad to receive. 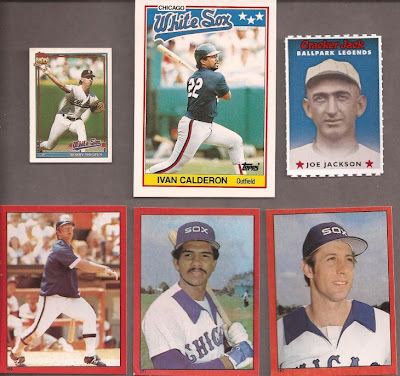 Heck - I would be glad to get a 91 Donruss of a White Sox if I didn't have one. How about 3 I didn't have? Jeff sent those along with a few more White Sox cards. However, none of them were the card he originally referenced. No - the specific card was this gem. Why sure - I would LOVE that card! Jeff left the card a surprise in his emails, so this was an awesome unveiling in the envelope. Jeff - the return package will be on its way later tonight. The other envelope in my mailbox came from Tim at the awesome Home of the Toddfather. Someone with want lists that include Rockies - heck yeah! I was able to clear out some 2013 Topps as well as a few older sets, plus a good dip into a few player collections. In return, Tim dropped 3 team bags stuffed with ChiSox. His note said "hope you can use some". Boy, can I! Minis, micros and stickers! I know I had a half dozen of the Cracker Jack Jacksons, but all disappeared. This is the first time I have ever seen the 82 Topps stickers at the bottom. In with these cards were a few 2011 A&Gs off my needs list. I still have so much to do with The Big Sort, and Tim just added to my challenge. That is not a complaint but a statement of joy, cuz now I have to sort cards like these. For his few productive years in Chicago, I don't have many Magglio cards. I also have every version of that Konerko Upper Deck X - except this die cut gold. Now I have all the versions. Thanks Tim. 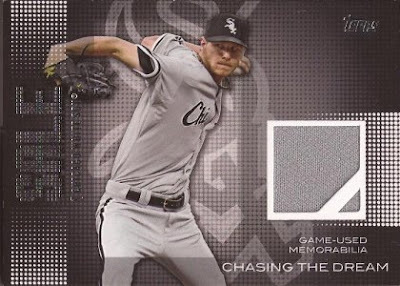 Two low number serials in the Thomas and the Konerko. And I don't remember who recently showed a card similar to that Black Jack Confex card (Nick? ), but boy I liked it. Now I have one. Thanks again to Jeff and Tim. Do you have wants? So do I - let's help each other get what we want. I'll tell you what you want, what you really really want. That Cracker Jack Joe Jackson is sweet. I've gotta find me a completed set.